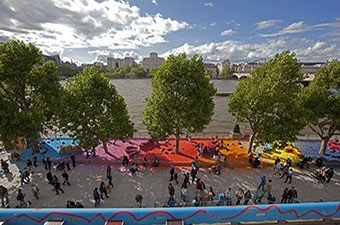 The active participation of viewers is a very important aspect of public art. 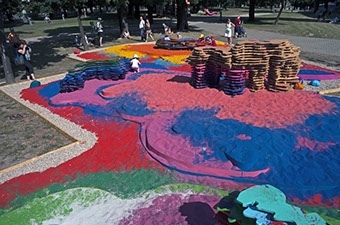 Here I want to present a few projects where the colored sand was used as a distinctive and interactive element of a project. The perception of these works is a fusion of physical, tactile, visual and iconological meanings of its elements. 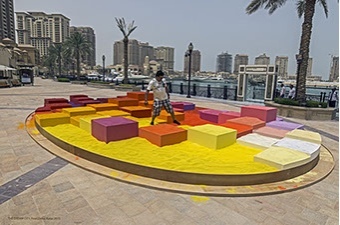 These projects evolve with the participants as a colorful expanse of sand which will never come back to the starting point (entropy process) but layered sculptural elements resembling fragments of rocks or outlines of clouds can also be used for rest. 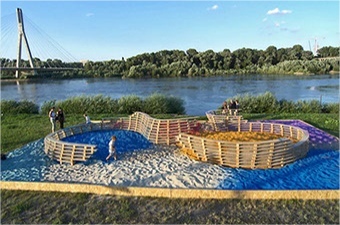 I invite you to explore a variety of weights, sand, colors and patterns that may arise during your barefoot walk through the project. The rest is a matter of your imagination.